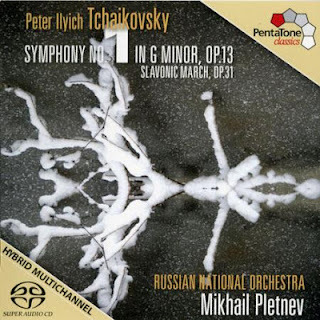 Mikhail Pletnev may have taken the subtitle of Tchaikovsky’s First Symphony – Winter Daydreams – a little too seriously, as his recording of the work is all about reveries and casual asides, with very little in the way of convincing symphonic argument. It is a tricky balance to get right, but Tchaikovsky offers plenty of substance and drama in this score to balance the more atmospheric passages. But time and again, Pletnev emphasises the latter, even through what would otherwise be stirring melodies and key thematic arguments. As ever, the Russian National Orchestra are on top form, as are the engineers from Pentatone, so Pletnev's daydreams are painted in clear, translucent colours with as much detail as you could hope for. The quiet opening, for example, a flute solo over tremolo strings, draws the listener straight into the music. The richness and warmth of the string and woodwind sound is a real strength of this orchestra, making its tone ideal for Tchaikovsky. But even from the very start the tempos are on the slow side, and while Pletnev does raise the temperature a bit for the main theme, it's not enough. More serious though, is the lack of accentuation in the tuttis. Without that agogic framework, the music just flows from one theme to another. It's all very pleasant, especially with orchestral playing of this calibre, but it rarely seems symphonic. The middle movements are similar. Unlike the first movement, the pacing here is more conventional, but Pletnev plays both for their atmospheric qualities. Surprisingly, there is enough atmosphere in the scherzo for it to function on this level, but it is not enough to make up for the distinct lack of drama and drive. Fortunately things improve in the Finale. After a few minutes of 'Andante lugubre' introduction, as flowing and atmospheric as anything we have heard yet, Pletnev picks up the pace in the long accelerando that leads into the main theme. And then, suddenly, we are into a proper Tchaikovsky finale, with lots of percussion and brass punching out the rhythms. The balance in the mix gives just the right prominence to the bass drum and double basses here, so that when they kick in you really know about it. (The timpani sounds curiously distant, although I'm listening in SACD stereo and it might sound better placed in the surround mix.) Sadly, the energy dissipates again before the end is reached, and the coda lacks the drive that the movement needs to finish decisively. This is partly the composer's fault, as a lot of the music in these last few pages is conventional to a fault. It need not drag though, at least not like this. March Slave is the filler, or rather the coupling, at 55 minutes you couldn't exactly call this disc full. This piece also runs the risk of sounding underpowered, especially as it shares its theme with the much more richly scored 1812 Overture. But Pletnev is able to make it work. This too is a reserved reading, but not fatally so, and the variety and ingenuity in Tchaikovsky's orchestration give the RNO plenty of chances to shine. Technically, this disc is beyond reproach, both in terms of the orchestral playing and the sound quality. The interpretation isn't to my taste, though others may disagree. It is certainly the case that Tchaikovsky's early symphonies don't play themselves. Difficult interpretive decisions must be made to reconcile their often contradictory demands. Previous recordings in this series have found Pletnev in complete artistic symbiosis with Tchaikovsky's scores. This time round he makes some radical decisions about tempos and accents, namely to play down both. The results don't really justify the risk.